It keeps muscle strength in tact, reducing your risk of falling. ​This senior exercise program is led by a trained peer-leader and done one to three times a week for 45-60 minutes. The course utilizes Therabands® and teaches strength, endurance, flexibility and balance. The PEPPI program is available at various sites throughout Clay County. Call Kevin Phillips at Northland Shepherd's Center at 816-452-4536 for more information on how to get the PEPPI program to your site. Classes and trainings are offered at no cost to Clay County residents. Funded in part by Clay County Senior Services. Focus on improving health and well-being through safe, structured, and effective strength training program. Sessions are led by a team of MU Extension specialists. It does require pre-registration and there is a fee. Please contact the University of MO Extension office at 816-407-3490. This program consists of 8, two-hour sessions and helps participants learn to view falls and fear of falling as controllable, set realistic goals for increasing activity, change their environment to reduce fall risk factors, and promote exercise to increase strength and balance. The course is free, but pre-registration is required. Matter of Balance is now offered through Northland Shepherd's Center. You can also call them at 816.452.4536. 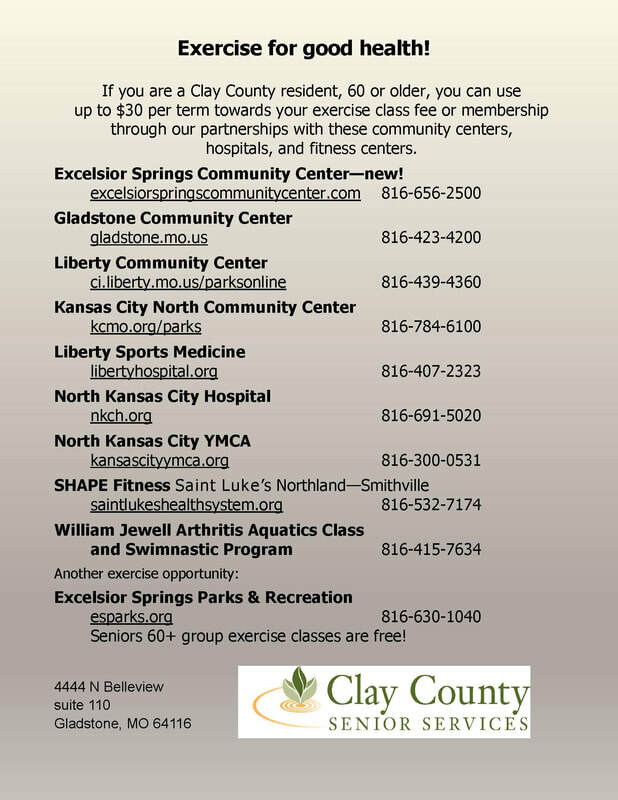 Classes are open to Clay and/or Platte County residents. Sponsored in part by Clay County Senior Services. Go4Life is an exercise and physical activity campaign from the National Institute on Aging at NIH. It is designed to help you fit exercise and physical activity into your daily life. Helps motivating older adults to become physically active for the first time, return to exercise after a break, or build more exercise and physical activity into weekly routines.